Biosensors are portable and convenient devices that permit the rapid and reliable analysis of substances. They are increasingly used in healthcare, drug design, environmental monitoring and the detection of biological, chemical, and toxic agents. 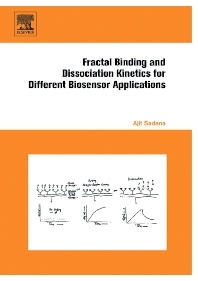 Fractal Binding and Dissociation Kinetics for Different Biosensor Applications focuses on two areas of expanding biosensor development that include (a) the detection of biological and chemical pathogens in the atmosphere, and (b) biomedical applications, especially in healthcare. The author provides numerous examples of practical uses, particularly biomedical applications and the detection of biological or chemical pathogens. This book also contains valuable information dedicated to the economics of biosensors. After reading this book, the reader will gain invaluable insight into how biosensors work and how they may be used more effectively.